Chest Protectors: All rookie and junior drivers up to 13 years in all divisions are required to wear a chest protection device with SFI specification 20.1. Level 2. Rib Protectors are recommended, but not mandatory. 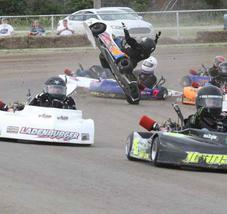 The use of chest protection is recommended for all kart drivers. Transponders must be mounted on the left rear nerf bar!! BOARD MEETINGS: will be held the first Tuesday of every Month Unless otherwise posted. Meetings start at 6:30pm & are held at the WaKeeney Mini Speedway (unless otherwise stated). Next Board Meeting: 1st. Tuesday of each month. WaKeeney Mini Speedway will require small pipes (Weenie Pips and Mufflers) on all clone motors for all Junior classes (including Rookies) for all events in 2018. This rule is in accordance with other tracks nearby and national touring series that sanction events in our area. Please contact a board member if you have questions.